(NaturalNews) The assault on the organic industry is in full swing today, and it's an attack not merely on the industry itself but an attack on your sanity. If you "believe" in organic foods and non-GMOs, you are about to be labeled a delusional conspiracy theorist. How do I know that? Because the lying mainstream media is rolling out the idea that organics are a "fable," a fairy tale myth. In one of the most idiotic, corporate-serving editorials I've ever seen, New York Times columnist Roger Cohen starts off with the title, "The Organic Fable." He then goes on to call organics a false "ideology," sort of a like a pseudoscientific cult. The study even confirms this with a second sentence: "Consumption of organic foods may reduce exposure to pesticide residues and antibiotic-resistant bacteria." The New York Times' Roger Cohen, then, is a confirmed liar. Or maybe his brain just doesn't work right because he eats high quantities of dementia-producing pesticide chemicals. Perhaps he's actually a victim of the very chemical pesticides and GMOs that he says are harmless. Do you see where all this is heading? The push is on now to try to declare anyone who believes in "organics" to be mentally insane. It's all being rolled out -- the use of "non-scientific" terminology, the invocation of a "cult" mentality, the "fairy tale" verbiage. According to Roger Cohen of the New York Times, only the people who eat pesticides and GMOs have brains that work correctly. Everybody else is delusional. He writes, "the organic ideology is an elitist, pseudoscientific indulgence shot through with hype." But eating chemical pesticides and genetically engineered foods containing toxins grown inside the grains is perfectly rational and intelligent, I suppose. It's "scientific" to want to eat poison! All you morons who want clean food are delusional, Cohen insists! To feed a planet of 9 billion people, we are going to need high yields not low yields; we are going to need genetically modified crops; we are going to need pesticides and fertilizers and other elements of the industrialized food processes that have led mankind to be better fed and live longer than at any time in history. Logically, the organic movement should favor genetically modified produce. Whaaa? Logically? By what logic? Somebody buy some adult diapers! This guy is defecating all over the New York Times website with nonsensical words that reek of a scatological accident! 2012 isn't over yet, so you may wonder how we can grant our "2012 Idiot of the Year" award when there are still four months to go. 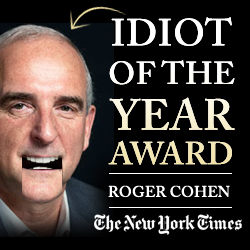 The answer is that I'm absolutely confident we will never encounter someone as idiotic as Roger Cohen. His act is impossible to beat. So the award is being granted today (see the picture below), and to celebrate it, I'm planning on sending Cohen some pesticides in the mail along with a request that he eat them on camera as a show of his loyalty to his own cult-like beliefs in poisonous chemicals. Oh wait, maybe I'd better not do that because sending toxic chemicals in the mail is a federal crime and considered an act of terrorism. Chemical weapons, you see, are illegal to MAIL someone, but Roger Cohen wants you to EAT them. So let me be the first from the organic movement to encourage Roger Cohen to eat more pesticides, Roger! The sooner you poison yourself with chemical pesticides and thereby disable whatever remaining brain cells are somehow still firing in your compromised skull, the better off we'll all be as a result. If this sounds mean, remember that according to Cohen, eating pesticides is GOOD for you! So I'm really only encouraging Cohen to eat more of what he claims is nutritious: GMOs and chemical pesticides. Yum! To Roger Cohen, I say: If you want to believe on your own delusions of how healthy and wonderful chemical pesticides and GMOs are for human health, go ahead and eat more. Make my day. But don't you dare call the far-better-informed organic consumers delusional and cult-like for knowing there is a real, qualitative difference between organics versus conventional crops. You only make yourself look like a complete fool while proving to the entire world that eating more pesticides results in a striking loss of cognitive function. You, sir, are a victim of your own pesticide delusions. Would you like this framed? Tweet out the URL of this NaturalNews article and help spread the word. Let Roger Cohen know that if he's going to declare organic consumers to be delusional cult-members, he's going to hear from a few of them as a result.